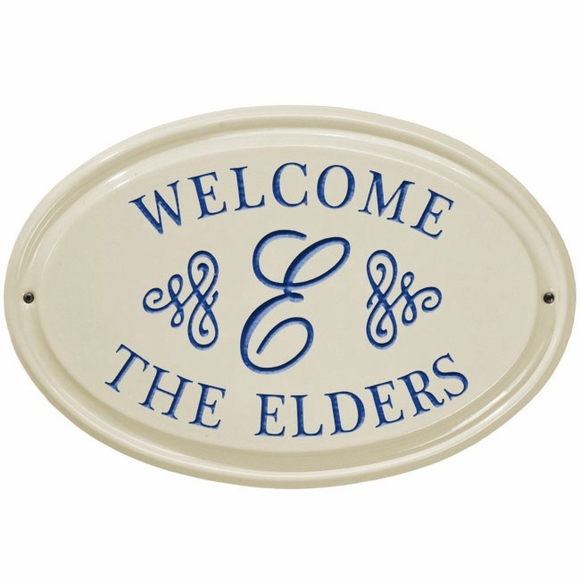 Personalized Ceramic House Plaque with Monogram -- holds three lines of personalization. Oval shape plaque mounts on wall. Line 2 holds one 3" script monogram. Line 3 holds up to twelve 1" characters (name as shown above, address, or whatever you desire). Bristol cream background with red, green, blue, or black text lines and monogram. High-fired vitrified ceramic withstands outdoor elements. Made in USA.